The very first Sandals has been masterfully reimagined to be the most modern, open-concept, 5-Star Luxury Included® Resort. 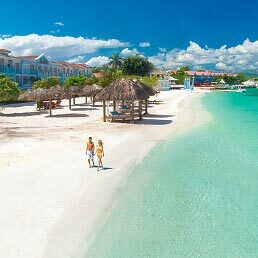 Innovative and luxurious, Sandals Montego Bay is nestled along the unending shoreline of the most exclusive, private white-sand beach in Jamaica, where offshore reefs create the calmest waters for leisure swims. Discover a chic and casual oasis, mere steps from the water, evoking a carefree spirit of romance and luxury. Our spectacular open-air lobby with magnificent sea vistas captures the island ambiance. There’s a new Over-the-Water Bar, and new Over-the-Water Chapel for an over-the-top experience. Enjoy even more of Montego Bay with exclusive play privileges at two nearby Sandals Resorts. At Sandals Montego Bay, the fun never stops and the beach never ends. Using key ingredients to guarantee fresh, authentic and flavorful dishes, our chefs have proudly debuted two brand-new restaurants – Butch’s Steak & Seafood and Soy Sushi Bar. Serving decadent specialities and unique culinary masterpieces, these new restaurants bring the total number of restaurants at Sandals Montego Bay to 12. Enjoy sunset cocktails and the 360° ocean views at Latitudes° Over Water Bar. Just steps from Montego Bay’s pristine white-sand beach, this offshore bar is the perfect place to relax and soak up the sun on a hammock suspended above crystal clear turquoise waters. Club Elite and Butler level guests enjoy complimentary round-trip airport transfers to and from Sangster International Airport (MBJ) in a private BMW luxury vehicle from our first class fleet. All other guests enjoy complimentary non-stop airport transfers in comfortable, air-conditioned vehicles. The stylish and spacious suites at Sandals Montego Bay offer extensive views of the beach and the magnificent turquoise-green sea from its privileged location just feet from one of the Jamaica’s most beautiful white-sand beaches. These Love Nest Butler Suites® are nestled directly on the beach and along a beautiful swim-up pool. All suites feature a Sandals signature Tranquility Soaking Tub™ for two and the ground floor suites boast swim-up access from the pool. Your dream wedding at our new Over-The-Water Serenity Wedding Chapel will surpass your expectations. This unique and picturesque venue features stunning 360-degree, panoramic views of the Caribbean Sea and a glass floor aisle, so you can truly be walking on water on your special day. Plus, this intimate venue features a Bell Tower and seats up to 40 guests. Perfect for couples in love, these newly built suites offer stunning oceanfront views from an oversized patio with a Tranquility Soaking Tub™ for two and direct access to the river pool. 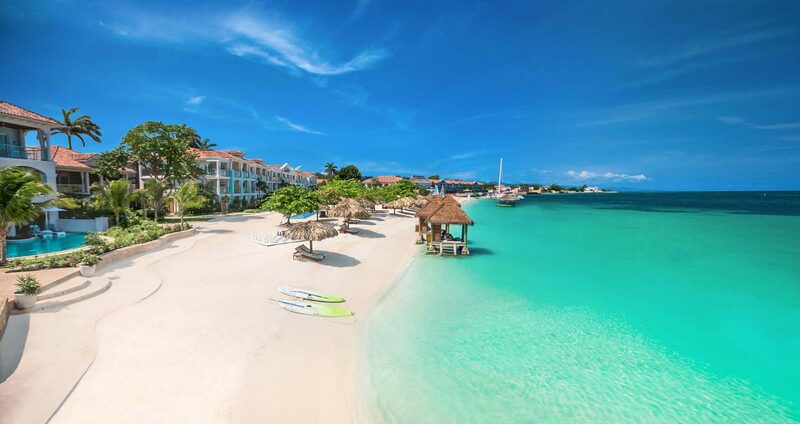 It's the Sandals the world first fell in love with, and it just happens to be set on the best and most exclusive stretch of beach in Montego Bay. Soft white sand and clear turquoise waters are bordered by a resort that offers everything from unlimited gourmet dining at nine restaurants and six bars to four pools and every land and water sport under the sun. Impeccable service, exquisitely‐prepared international cuisine, and a romantic ambience make every dining experience a celebration of your love at Sandals Montego Bay. With our exclusive Stay at One Play at Three Program, you can expand your options to dine and play at two additional resorts. Complimentary round-trip transfers between all resorts are part of the Sandals Luxury Included® difference. Tennis, day and night, on lighted courts surrounded by fragrant tropical flowers and cool breezes that flow through towering trees. Croquet on emerald-colored manicured lawns. Volleyball on pillow-soft sand. At Sandals, there are no limits to what you can play. Sandals Montego Bay is home to six amazing pools and three whirlpools. 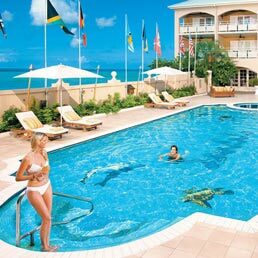 Everything you need is just steps away from the main pool, including flavorful Jamaican cuisine, tropical cocktails at the nearby bar and the Caribbean Sea beyond. At Sandals, all gratuities are included. From bellhops, to waiters, to bartenders, all tips are taken care of. In fact, only personal butlers are allowed to receive tips. Enjoy Sandals Resorts’ industry-leading hospitality and personalized service, and leave your wallet at home. The ideal pathway to mind-body rejuvenation begins at the Red Lane® Spa. Loosen up with our West Indian massage, or try body exfoliation with pure island sand. Reserve a massage on the beach or in the privacy of your room. It's all about you and it's about time - now that you have it. Anyone can claim to offer an authentic experience of the islands. But, Island Routes excursions are led by people born and bred on the island, and they can't wait to share all the best spots and most exciting adventures with you! Island Routes offers luxury adventure tours that range from completely exhilarating to delightfully sedate. 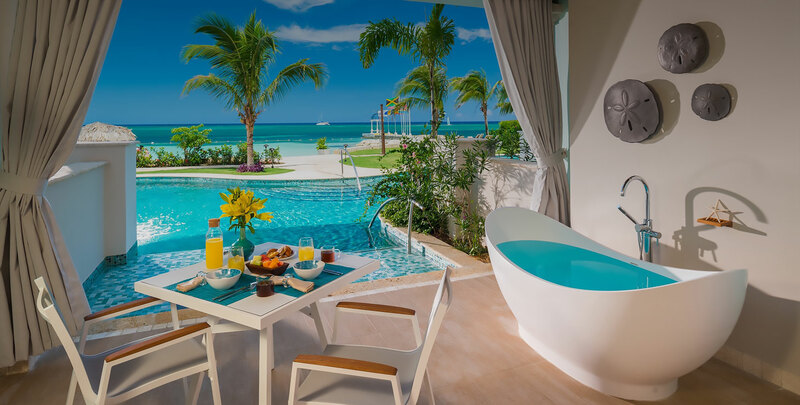 The stylish and spacious suites at Sandals Montego Bay offer extensive views of one of Jamaica’s most beautiful white-sand beaches and the magnificent turquoise-green sea. With 12 tantalizing restaurants offering sumptuous temptations, deciding where to go for dinner might well be the most challenging part of your day. Impeccable service, exquisitely-prepared international cuisine, and a romantic ambience make every dining experience a celebration of your love at Sandals Montego Bay. In Montego Bay, you get a mega-vacation that includes three resorts for the price of one. Experience all the restaurants, all the beaches and every amenity. Plus, round-trip transportation is included between resorts. Round-Trip Transfers from Montego Bay Airport (MBJ) to all Sandals Resorts in Jamaica are included. Get up to $605 Instant Credit. For inclusive offer, the $605, $505, $405, $305 & $225 Instant Credits are in USD, applied to the base fare and excludes government taxes and fees, which must be paid at time of booking and is fully non-refundable.